Editor's Note: With the closure of this comment period, the National Trust submitted the following letter on the proposed CEQ Regulations. The White House Council on Environmental Quality (CEQ) recently published an advance notice of proposed rulemaking in the Federal Register, requesting public comments through August 20 about plans to update the implementing regulations of the National Environmental Policy Act (NEPA). The goal of the update would be to ensure a “more efficient, timely, and effective NEPA process.” This review has been prompted by Executive Order 13807, issued in August 2017, and is part of the Trump administration’s overall efforts to “streamline” environmental permitting for infrastructure projects. 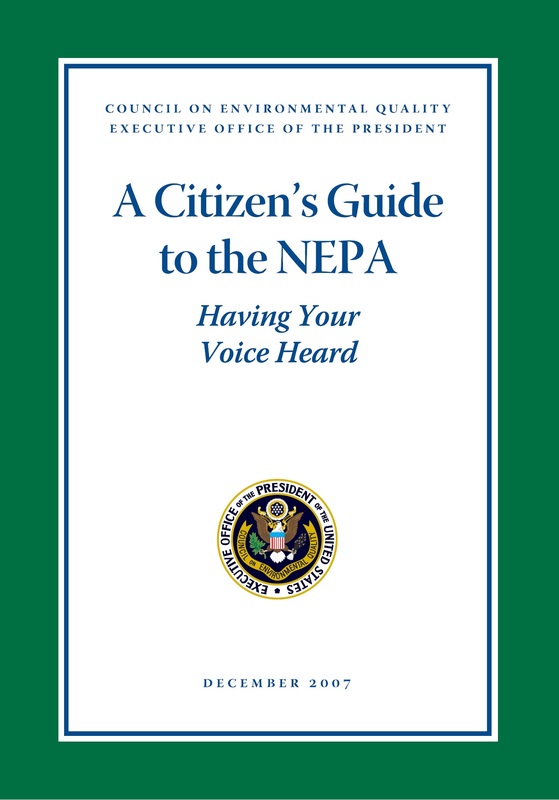 "A Citizen's Guide to the NEPA" is available on the Bureau of Land Management's website. The Congress, recognizing the profound impact of man’s activity on the interrelations of all components of the natural environment, particularly the profound influences of population growth, high-density urbanization, industrial expansion, resource exploitation, and new and expanding technological advances and recognizing further the critical importance of restoring and maintaining environmental quality to the overall welfare and development of man, declares that it is the continuing policy of the Federal Government … to use all practicable means and measures … in a manner calculated to foster and promote the general welfare, to create and maintain conditions under which man and nature can exist in productive harmony, and fulfill the social, economic, and other requirements of present and future generations of Americans. The heart of NEPA is its requirement that agencies take a “hard look” and consider alternatives when making decisions about projects that could impact the human environment. NEPA also established opportunities for public participation and comment to ensure that federal agencies take the public’s concerns and opinions into account. Much like the National Historic Preservation Act, NEPA is a procedural statute that requires federal agencies to follow an established decision-making process to consider public input and alternatives that meet a project’s purpose while minimizing negative environmental impacts. NEPA has a long history of contributing to positive preservation successes. In recent years, working through the NEPA process has helped minimize the negative impacts of highway expansion projects at Woodlawn, a National Trust for Historic Preservation historic site near Mount Vernon in Virginia. NEPA has also helped protect a historic post office in Connecticut and a traditional cultural property in Guam. The NEPA regulations currently under review were originally promulgated by CEQ in 1978 to guide federal agencies in complying with NEPA, and there has been only a single minor revision to these regulations in the last 40 years. CEQ’s public comment notice includes 20 questions indicating that a wide range of issues are being considered for regulatory changes. Potential changes include amending public participation requirements, revising the range of alternatives that agencies must consider, and requiring review deadlines that may not take into account the complexity of individual projects. This review process has the potential to dramatically change the way NEPA is implemented across federal agencies and could significantly weaken the law’s effectiveness. Input received during this initial comment opportunity regarding proposed regulatory changes will help to guide CEQ’s next review steps. Given the significance of NEPA for ensuring the protection of the nation’s historic and cultural resources, CEQ needs to hear from the preservation community about the importance of maintaining the effectiveness of this law. The comment period closes on August 20, 2018, so please join the National Trust in supporting effective NEPA regulations by submitting a comment today. Sharee Williamson is associate general counsel for the National Trust for Historic Preservation.